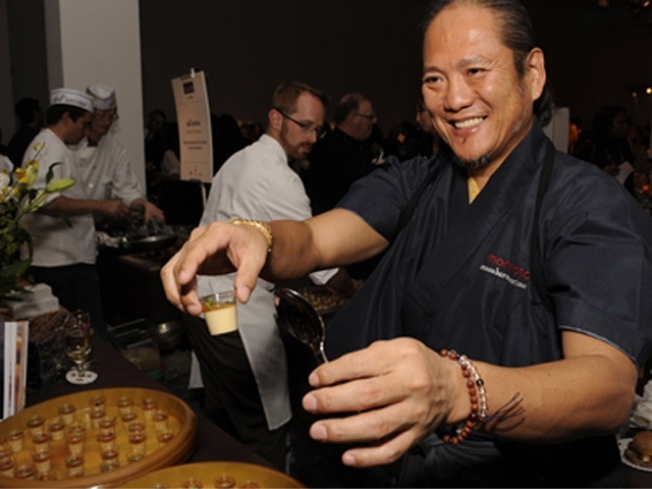 Chef Morimoto serves it up at 2008's New York Taste. EAT UP: Hopefully by Monday night, you’ll have moved past your Halloween sugar coma. Or at least regained enough appetite to appreciate the 2009 New York Taste event, the 11th annual gastro-spectacular hosted by New York magazine to benefit City Harvest. More than 40 of the city’s finest restaurants will dispatch chefs to Skylight (Andrew Carmellini of Locanda Verde, Morimoto, Audrey Saunders of Pegu Club) to feed you small bites and talk to you about their creations. 7PM. SATISFACTION: Game-changing documentarian Albert Maysles – he of “Grey Gardens” – didn’t get enough of the Rolling Stones with “Gimme Shelter” – he’s made a second Stones doc, “Get Yer Ya-Yas Out!”, featuring unseen footage from the band’s epic 1969 U.S. tour. He’ll be at the IFC in person to present tonight’s 8:45PM screening; the film itself is playing for one week only, ending Thursday. ROOTS: Maria Muldaur is one of those liminal figures in music: She’s played folk, blues, and pop, charted with “Midnight at the Oasis” in 1974 and opened for the Grateful Dead, revived music made popular by the likes of Peggy Lee and Bessie Smith… and now she’s come full circle to where she started: Playing with a jug band. Muldaur and her Garden of Joy Jug Band take over Joe’s Pub tonight, no doubt making the place feel like a back porch somewhere sultry. 9:30PM.